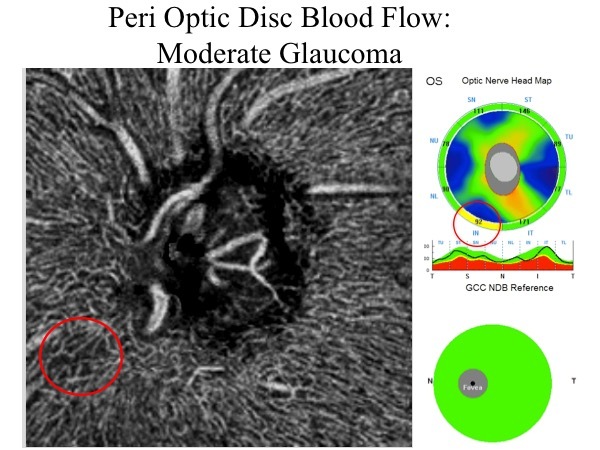 The vascular theory of glaucoma attributes the development of glaucomatous changes to, among others, reduced perfusion pressure, faulty vascular autoregulation and loss of neurovascular coupling in the eye. However, the exact role of these factors is yet to be elucidated. To some extent, this can be blamed on the lack of clinically applicable imaging techniques to study vascular changes in glaucoma. Conventionally, assessment of retinal and choroidal circulations is done by Fluorescein Angiography (FA) and Indo-Cyanine Green Angiography (ICG-A). However, these investigations require intravenous administration of contrast agents which have certain limitations such as contraindication of use in pregnancy and in patients with poor renal clearance. The dye can also cause allergic reactions which can prove life-threatening in susceptible individuals. These tests are hampered by their ability to only provide 2-dimensional images with limited information regarding the depth of the lesions. Certain other non-invasive imaging techniques have been utilized to visualize and quantify ocular circulations. These include: Ultrasound Color Doppler, Functional Magnetic Resonance Imaging, Laser Doppler flowmetry and velocimetry, blue field entoptic technique and laser speckle assessment. However, their clinical use is limited by their complexity, poor reproducibility and wide variation in populations. Similarly, Doppler OCT can also measure and quantify different blood velocities in larger vessels but it is not well suited for retinal and choroidal microvasculature where vessels are nearly perpendicular to the OCT beam. OCT is a non-invasive, real-time imaging modality, in common use all over the world. 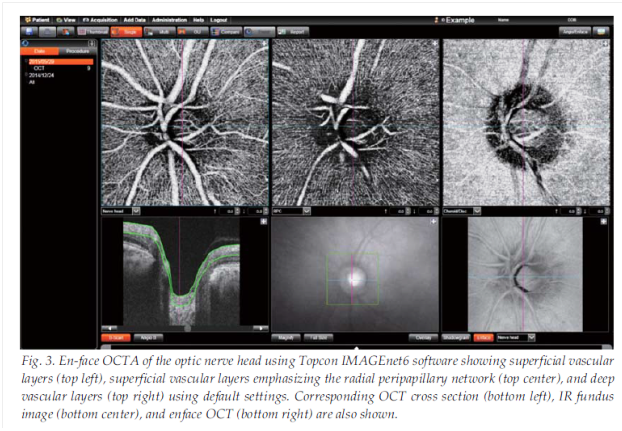 Over the last couple of years, the advent of better and faster OCT machines has enabled the use of OCT-A to obtain high resolution 3D angiograms of the retinal and choroidal vascular networks. 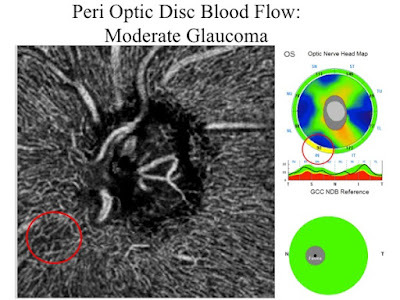 This allows detection of microvascular changes in glaucomatous eyes. OCT-A detects the motion of red blood cells (RBCs) using intrinsic signals to capture the location of blood vessels. Thus, OCT-A identifies blood vessels by detecting the blood flow-induced change in the OCT reflectance signal. The procedure requires repeated B-scans at the same location to detect motion of the blood. This can only be achieved by fast spectral-domain OCTs. RBCs flowing in the blood vessels produce changes in the OCT reflectance signal, which can be quantified in terms of intensity, phase or intensity+phase of the OCT signal. The faster the speed of the flowing RBCs, the greater is the flow signal; unless a saturation level is reached. 1. Split-spectrum amplitude decorrelation angiography (SSADA): This is a signal processing algorithm which splits the OCT signal into different spectral bands to increase the number of usable image frames without increasing the scanning time or decreasing scan density. SSADA was able to produce angiograms of retinal and choroidal vasculature with only 2 consecutive B-scans. 2. OCTA ratio analysis (OCTARA): This is a motion contrast measure using a ratio method. The full spectrum is kept intact and axial resolution preserved. 3. Optical microangiopathy (OMAG): In this, calculations are based on the absolute difference between linear intensities. 1. Vessel density (VD): It is the percentage area occupied by the large vessels and microvasculature over the imaged area. 2. Flow index: A dimension-less parameter between 0 and 1 representing the average decorrelation signal. It measures the area of large vessels and the area and velocity of retinal microvasculature. 3. Blood flow index: It is the mean flow intensity in the vessel area normalized between 0 and 1 by dividing the full dynamic range of blood flow signal intensity. However, it should be remembered that these indices are surrogate measures and their validity for measurement of blood flow remains to be investigated. OCT-A produces a 3D dataset of scanned vascular tissue. Subsequently, automated or semi-automated segmentation algorithms are used for accurate segmentation of the structural image in order to have optimal evaluation of the retinal and choroidal vasculature. Appropriate tissue layers or “slabs” can then be defined based on these reference planes. The enface presentation of these slabs produces angiograms similar to FA or ICG-A. In Primary Angle Closure Glaucoma (PACG) patients, immediately following an acute angle closure attack, significantly decreased vessel densities in the peripapillary regions was reported despite normal retinal nerve fiber layer thickness (RNFLT). The peripapillary region refers to a 700µ wide elliptical annulus extending from the optic disc boundary. Comparison of PACG and Primary Open Angle Glaucoma (POAG) eyes has shown the decrease in vessel density (VD) in PACG to be more evenly distributed in the peripapillary region. Conversely, in patients with POAG, there is lower perfusion in the infero-temporal peripapillary region, corresponding to the frequent superonasal VF changes. OCTA has the ability to visualize and reliably quantify the optic nerve head (ONH) vasculature. A 25% decrease in the flow index of ONH has been reported in glaucomatous eyes. This was found to have a strong correlation with the pattern standard deviation in visual fields. Patients with lamina cribrosa defects were also found to have lower vessel density in the peripapillary region. Patients with uncontrolled IOP also have significant reduction in ONH and peripapillary VD. Studies have also reported a decrease in vessel density to be strongly associated with severity of VF damage. The VD reduction in the optic disc was also found to be closely related to ganglion cell complex thickness. 1. Weak OCT signal= OCT signals can be reduced globally due to media opacities, pupil vignetting and defocusing of the light beam. OCT signal can also be lost below large caliber vessels or hyper-reflective retinal lesions. 2. Motion artifacts= Bulk tissue and saccadic eye movements can produce noise and motion artifacts. In order to overcome these artifacts motion-correction-technology and eye-tracking have been used to overcome motion artifacts. However, OCT-A can still show residual defects such as motion lines, vessel duplication or vessel discontinuity. More advanced processing algorithms are required to eliminate these artifacts from OCT-A. 3. Projection artifacts= When RBCs flow in superficial vessels they cast time-varying shadows on the deeper retinal layers. These flow projection artifacts lead to duplication of the superficial vascular pattern on deeper microcirculation, as well as the normally avascular outer retinal slab. 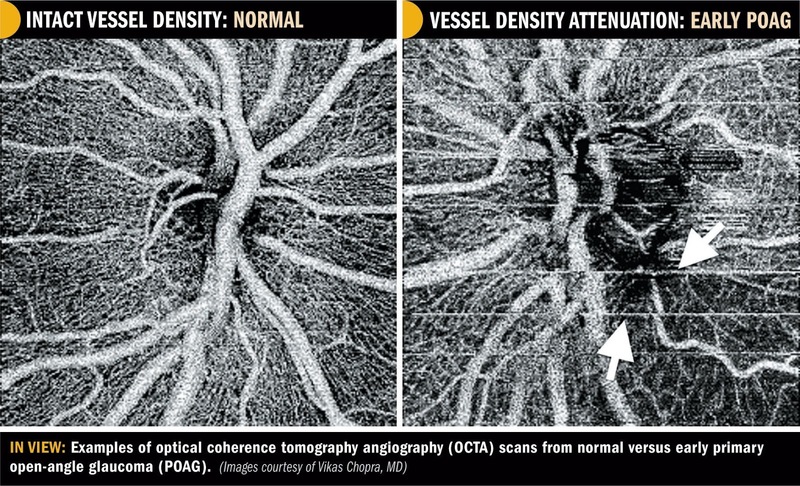 OCT-A projection artifacts can lead to inaccurate measurement of flow index and vessel density of deeper retinal vasculature. In order to overcome these artifacts the superficial flow signal can be subtracted from the deeper en face angiograms, known as “slab-subtraction” method. However, this process can disrupt the continuity of vessels in the deeper vascular plexuses and potentially underestimate their vessel density. 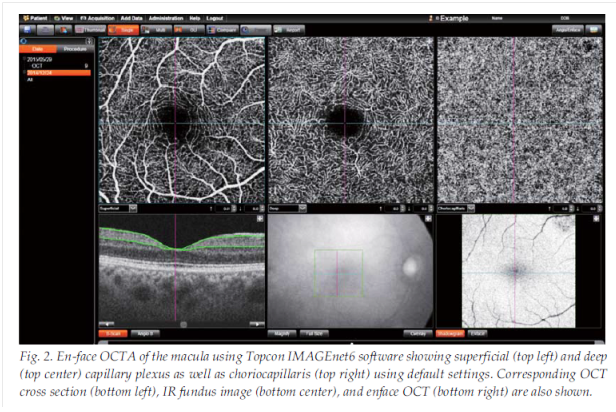 The newer “projection-resolved” OCT-A suppresses the projected flow signal while preserving the natural continuity of ocular microvasculature, allowing improved visualization and quantification of different retinal vascular layers in normal and diseased eyes. An advantage of OCT-A is that both perfusion and corresponding structural information (en face OCT) of the different retinal layers are imaged and measured respectively, on the same image. Thus, the combined analysis of the images and measurements is useful in finding conformity between a structural abnormality and its perfusion. The diagnostic accuracy of peripapillary and whole-image angio-flow density for separation of glaucoma eyes from normal eyes is similar to that of the RNFLT. The perfusion and peripapillary OCT-A sectors show strong relationship with the sensitivity and defect values of the spatially corresponding VF areas. Patients with uncontrolled IOP were found to have significant reduction in ONH and peripapillary VD. Hollo has reported that IOP reduction to atleast 50% of the pre-treatment value and below 18 mmHg causes a significant increase in the peripapillary angioflow density. A disadvantage of OCT-A is the small field of view, which restricts its image acquisition to the posterior pole. It needs to be highlighted that lack of perfusion on OCTA does not necessarily mean missing or obstructed vessels or lack of capillary perfusion; in contrast, it simply means that at the time of image acquisition, no moving RBCs were present in the location of the low perfusion or non-perfusion OCT-A areas. OCT-A of the ONH is available with most machines; however, the presence of large vessels and the variability and complexity of the 3D structure of the disc makes it difficult to interpret the measurement results.